Finally got to peruse beautifully scenic Eternal Valley Memorial Park in Newhall yesterday. Yay! This cemetery has been on my wish list for a long time. 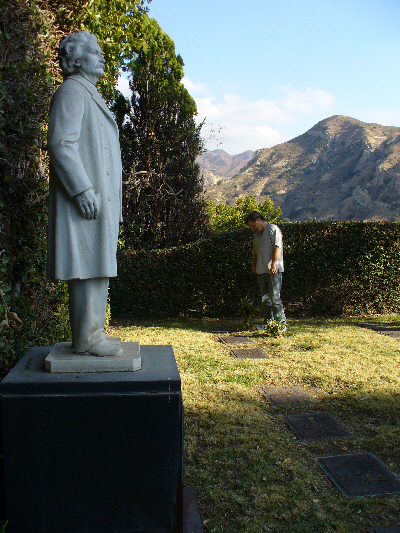 Walter reading headstones near Mark Twain's statue. 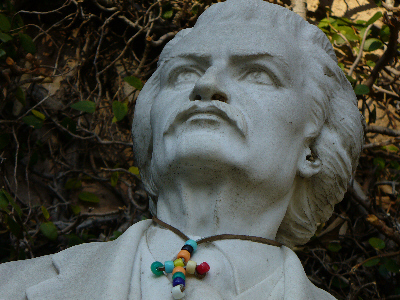 Someone gifted Mark Twain with some beaded bling. In the Twain garden we found not one but two "celebrity imposter" markers: Edgar A. Poe and Bette Davis. EV is home to several famous permanent residents, including wrestler/actor Tor Johnson of Ed Wood films fame, singer Gene Vincent and George Spahn, owner of the infamous Spahn Ranch, former Manson Family headquarters. Since this was a spontaneous trip, we didn't have famous grave location notes from Findagrave.com in hand, but enjoyed getting to know the grounds just the same. One of the more unsual things to see at EV is the last horse-drawn hearse ever used in Los Angeles County, which is on display just inside the front gate. See photos of the hearse, and all the pix I snapped yesterday afternoon, on my Flickr album.